People in Virginia can acquire Zika through the bite of an infected mosquito, during travel to an area where the virus is circulating among mosquitoes. The infection is transmitted primarily by mosquitoes. It is most commonly transmitted by the yellow fever mosquito (Aedes aegyptii), but the Asian tiger mosquito (Aedes albopictus) can also transmit it. Both of these mosquito species circulate in Virginia, with Asian tiger mosquitoes being the most common nuisance mosquito here. Therefore, there is a risk of Zika virus being imported into Virginia and being transmitted by local mosquitoes during mosquito season. At this time of year neither of these two mosquito species are active, so infection by mosquito bite is not possible. When the mosquito season begins in May, there is potential for our local Yellow fever mosquitoes and Asian tiger mosquitoes to become infected with the Zika virus by biting infected persons who have returned from areas of Zika activity. These two mosquito species are different from most other mosquito species in Virginia because they fly and bite during daylight hours and will enter homes through any open door or window and bite indoors. These two species are also different from other species because they lay their eggs exclusively in containers of water (i.e. containers made of plastic, ceramic, glass, metal, concrete, wood or stone) and they do not lay their eggs in “ground” bodies of water such as puddles, flooded ditches, ponds or streams. Thorough inspection of residential and commercial properties to find and eliminate, dump, or treat the containers of water that these mosquito species lay their eggs in. Effective treatment of a neighborhood often requires a property to property effort. Spraying of aerosol fogs into the foliage of shrubs, hedges, ivy and other vegetation or structures where these mosquitoes sit. Spraying of residual insecticide barriers on the foliage of shrubs, hedges, ivy, other low vegetation or walls on properties where these mosquitoes are abundant. Maintaining screens on all home/building windows and doors to prevent the entry of these mosquitoes into the home. See CDC’s Division of Vector-borne diseases website for more information on mosquito-borne illnesses. 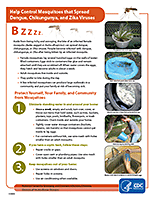 See the Virginia Mosquito Control Association’s website for information about statewide mosquito control efforts.